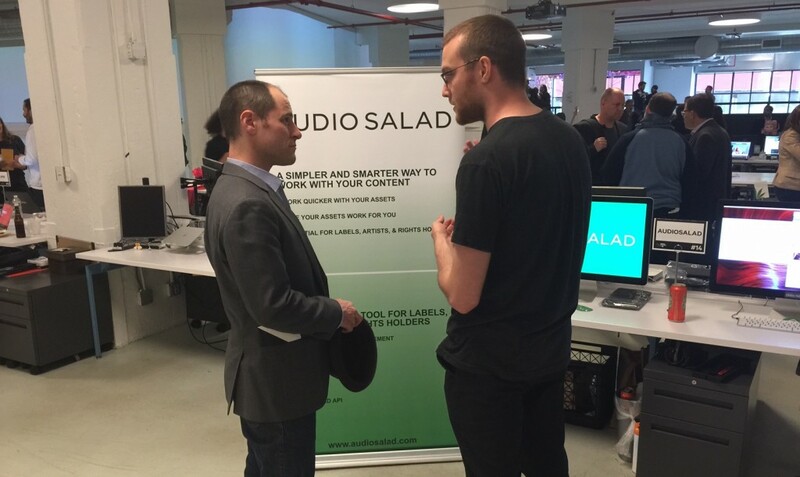 AudioSalad’s Anthony Stewart discusses the platform with a demo day attendee. Since December 2014, AudioSalad HQ has been located in the Made in NY Media Center by IFP. Based in the heart of Brooklyn’s tech and media communitiy in DUMBO, Brooklyn, the Media Center provides small companies with collaborative workspaces and unique business opportunities. Their flagship program is the annual Demo Day. Each year, the Media Center opens its doors for local industry leaders to meet the companies in the space and connect for potential partnerships and investment. We were very happy to participate in this year’s Demo Day Marketplace. It was a pleasure to show off the work we have done in the past year, meet contacts in the tech and media industries, and learn more about the amazing projects our peers are working on in the Media Center. We can’t wait for the next one!